Since 1994, the FINE permeation tubes act in the market as spare parts for gas and air qualityan alyzers. In particular the manufacture of FINE permeation devices are especially used as a source of trace gas wich allows the calibration of air pollution analyzers; they are also used to make tests on gas sensor systems. Tubes are filled by Sulphur Dioxide, Nitrogen Dioxide, Ammonia, H2O, Hydrogen Sulfide, Mercaptans and other hundreds of different compounds are available. 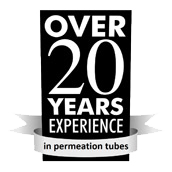 Permeation tubes are employed for gas test equipment calibration in alternative to the use of the gas standards cylinder-supplied calibration. In 2014 “FINE Permeation Tubes” becomes “FINE Metrology”.